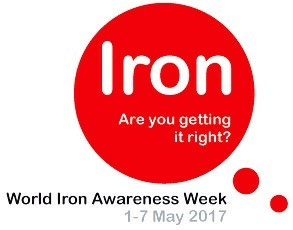 Increasing awareness of the importance of iron to good health is the aim of World Iron Awareness Week from 1-7 May this year. Adequate iron intake is essential for human health but having too little or too much can cause harm. “We need the right amount of iron in every cell of our body to be healthy and strong, yet iron deficiency remains the most common nutritional deficiency in the Western world,” said Clare Collins, Accredited Practicing Dietitian (APD) and Spokesperson for the Dietitians Association of Australia. At the other end of the scale, iron overload is a serious condition that results from the incorrect uptake, processing and storage of dietary iron within the body. Iron deficiency often shows up as tiredness or fatigue but excess iron can cause the same symptoms. For this reason, Di Prince from Haemochromatosis Australia recommends people see a GP for blood tests before taking iron supplements. Iron overload, caused by a genetic predisposition and known medically as haemochromatosis, is present in about one in 200 people of European origin. When undetected and untreated, iron overload can cause organ and tissue damage potentially resulting in premature death. “People with iron overload often feel tired all the time, sometimes with aching joints. Excess iron can continue to build up in the liver, the heart and other organs causing serious problems including arthritis and diabetes,” Professor John Olynyk said. Haemochromatosis is the most common genetic disorder in Australia but public awareness of the condition is low. Consequently, many people suffer the effects of iron overload without it being diagnosed.